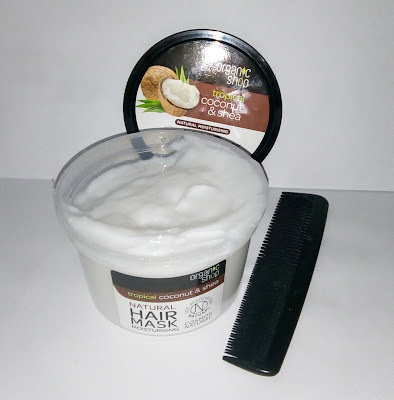 As promised, I am now writing my review of ORGANIC SHOP Tropical Coconut & Shea Hair Mask, another gifted product from my Free From Show goody bag. ORGANIC SHOP Tropical Coconut & Shea Hair Mask is a moisturising hair mask made from ingredients of 98% natural origin and does not contain parabens or silicones. It contains Organic Coconut ("nourishes strands, to leave hair lustrous and shiny"*) and Organic Shea ("boosts hydration to repair split ends and smooth frizz, leaving hair rejuvenated and revived"*). I was interested in this product because sometimes after washing my hair it can be a bit unmanageable and frizzy. Following the directions on the tub, after shampooing my hair, I applied the mask to damp hair and massaged it in well. I enjoyed the lovely scent of coconut and the texture of the mask felt rich and creamy. The instructions suggested leaving it on for 2-3 minutes, or longer if a more intensive treatment was required. I actually kept it on for 6 minutes before rinsing it off thoroughly. After drying and styling my hair, I was delighted with the result! My hair was smooth, shiny, manageable and it seemed to look thicker too. ORGANIC SHOP Tropical Coconut & Shea Hair Mask certainly does what it claims to do (*see above claims). I will most definitely be using this marvellous hair mask regularly in future. Now the price. This is quite amazing!!! At only £2.50 for a large 250ml tub, this is a really inexpensive way to give hair a first-class treatment. The tub is going to last quite a while too because I found that I only needed to use a small amount of the mask.